Staff Sgt. Ayman A. Taha was born on July 2, 1974, in Sudan. He was a trained Special Forces Engineer noncommissioned officer assigned to 3rd Battalion, 5th Special Forces Group in Fort Campbell, Ky. He died in an explosion Dec. 30, 2005, while preparing to dispose of enemy munitions discovered near Balad, Iraq during combat operations in support of Operation Iraqi Freedom. A resident of Clarksville, Tenn., Taha was a native of Sudan. 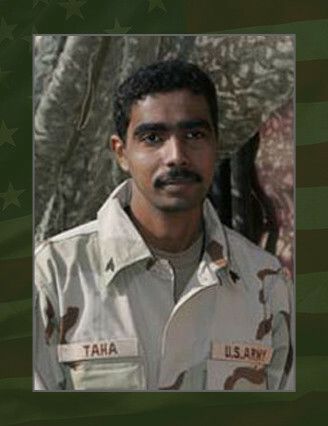 Taha entered the Army in August 2002 under the 18X program. This program allows selected individuals to enlist directly for Special Forces Training as a result of preexisting unique skills. He was an Arabic speaker. He began his Army career by completing Basic Infantry Training and Airborne School, both at Fort Benning, Ga. In 2003, Taha began training at Fort Bragg, N.C., where he completed the Special Forces Engineer Sergeant’s Course, the Survival, Evasion, Resistance, and Escape Course, the Primary Leadership Development Course and the Basic Non Commissioned Officers Course. He was later assigned to 3rd Battalion, 5th Special Forces Group at Fort Campbell, Ky., in January of 2005. He served as a member of a Special Forces Operational Detachment-A or A-Team. Taha’s civilian education consisted of a bachelor’s of science in economics from the University of California at Berkeley in 1997 and a master’s in economics from the University of Massachusetts in 2001. He deployed with 5th Special Forces Group to Iraq in support of OIF this past summer. His awards included the National Defense Service Medal, Global War on Terrorism Service Medal, NCO Professional Development Ribbon with Numeral Two Device, the Special Forces Tab and the Parachutists Badge. He was posthumously awarded the Bronze Star Medal, the Purple Heart, the Meritorious Service Medal, the Iraq Campaign Medal, the Army Good Conduct Medal and the Combat Infantryman Badge. Taha is survived by his wife, Geraldine and his daughter, Sommer, both of Tennessee. His parents, Abdel-Rahman and Amal Ali both of Virginia, also survive him.